Cord cutters are a relatively new breed of TV programming consumer. No longer willing to pay increasing costs for channels they don’t want, this rising populace is ditching their cable or satellite subscription in favor of a combination of local broadcasts and Internet-delivered TV from services like Netflix, Hulu Plus, and Amazon Instant. All they need is an HD antenna, an Internet connection and one of a growing list of smart devices loaded with the necessary apps. 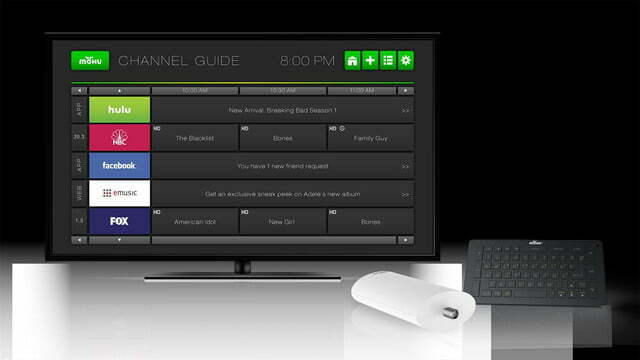 The trouble is, navigating to all the available content – switching between inputs and apps – is nothing like the channel surfing many of us are used to, which creates a sort of barrier to entry. But what if there were a single device that bundled up broadcast TV and all of that online content into an intuitive interface that felt just like the channel flipping we’re already used to? 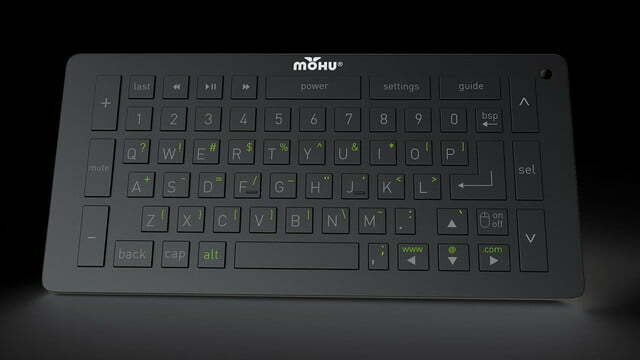 Enter Mohu’s Channels. 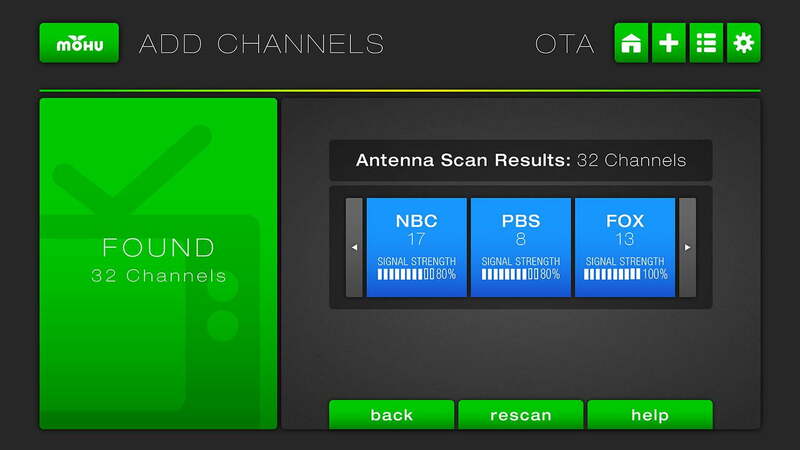 Channels isn’t meant to be just a simple set-top box with the ability to tune into locally broadcast content through an antenna. Rather, the planned device aims to take those live broadcast feeds, add the full run of the Internet via Ethernet or Wi-Fi, and combine them into a sleek interface with a guide-enabled, up and down channel configuration you can arrange in any order you choose. Want channel 1 to be Netflix? No problem. Does channel 2 sound like a good spot for ABC? Do it up. We sat down for an interview with Mohu CEO Mark Buff, and Chief Marketing Officer, Randy Drawas, to find out about their new Channels project, which is slated to hit Kickstarter early next week. The two broke the system down for us, outlining why they think it will be the next boon to cord cutters everywhere – and we have to say, they made a pretty compelling argument. Want channel 1 to be Netflix? No problem. Does channel 2 sound like a good spot for your favorite local network affiliate? Do it up. And for channel 3, how about your knitting club’s official website? 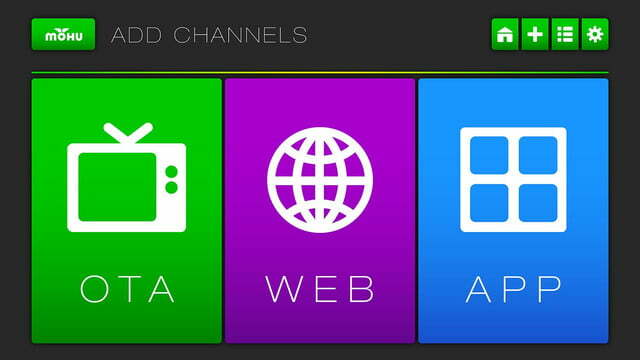 Yes, Channels can do that too. Control of the system is handled by a backlit, motion-sensing remote with a full qwerty keyboard designed to let you type with your thumbs – you know, 21st century style. The remote is also programmable as a universal remote for your TV. 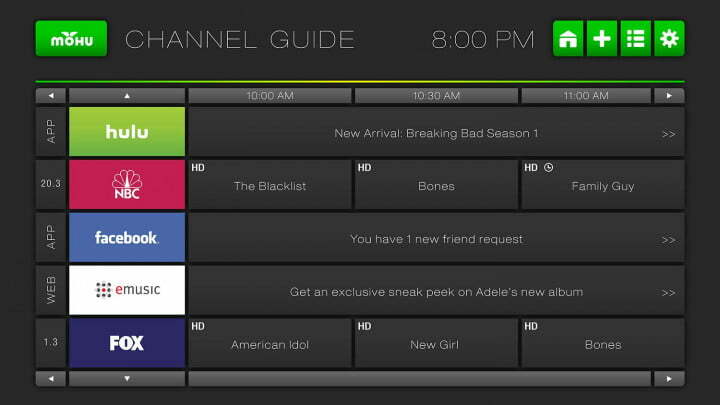 Setting your channel guide is done in three ways, starting with what Drawas described as a ‘smart’ channel scanner. The scanner lets you easily keep or toss broadcast channels, and reveals each channel’s signal strength both during the scan, and afterword. The guide also pulls metadata from each channel, letting you know what’s on, and what’s coming up for all local broadcasts, just like cable. Apps are acquired via the Google Play store, where you’ll find everything from Netflix to, well, basically every other service online. Once an app is downloaded, it auto-populates as your next channel, and can then be arranged in any order you choose. But perhaps most interesting is the ability to seek out any site on the web and bookmark it as its own channel in the lineup. That feature allows your Channels setup to be extremely versatile, highly personal, and different from just about anything we’ve experienced before. By now, the budget-savvy cord cutters are all probably wondering what this little setup might cost. The initial price is surprisingly reasonable, especially if you don’t yet own an antenna. At launch, the early bird special, which comes with just the Channels box and qwerty remote, is $79 for the first 200 pledges, and $89 after that. 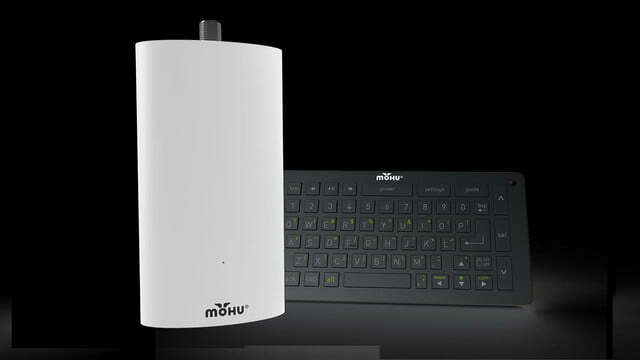 A combo pack with the Mohu Leaf 30 antenna (normally $40) will be $99 for the first 100, and $119 after that. And for those in the boonies, the box and an amplified Mohu 50 antenna ($70) will be $129 for the first 100, and $149 after words. 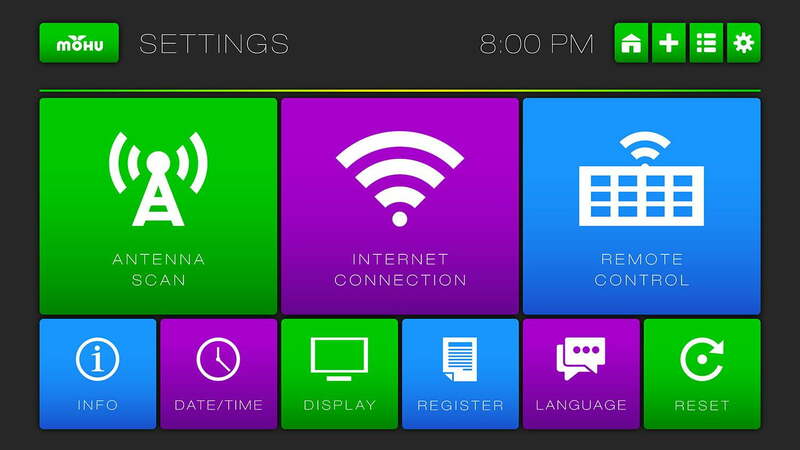 Of course, the success of Channels is entirely dependent on a system that works as intuitively as Mohu is promising. Drawas assured us the hardware is already done, while the software is still undergoing some “tweaks.” But in our short interview, both Buff and Drawas sounded confident that the device’s aims are not only do-able, but close to the final stages. 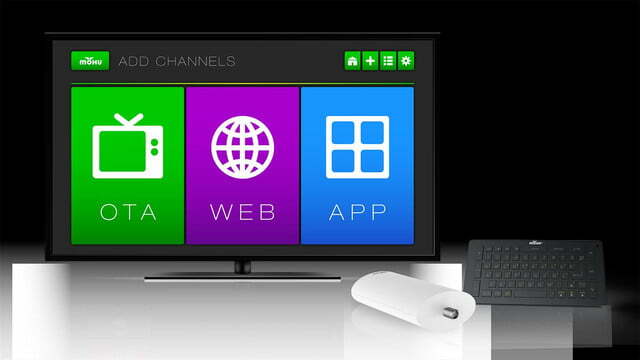 Mohu hopes to release Channels to the public in June 2014, at a price promised to be higher than what you’ll get through the Kickstarter campaign. The campaign has an end goal of $35,000. And given Mohu’s wide number of users already on board with the original Leaf antenna (which, full disclosure, includes this reporter) that should be an easy goal. If you want in on Mohu’s vision of the ideal cord-cutting tool, you can make your pledge at Mohu’s Kickstarter project page starting early next week.